Success in today’s business climate sometimes requires you to push aside your passion for your business and spend time sorting out your finances – not a pleasant thought! But did you realise that a major part of managing your finances can be taken care of using one very simple tool – a cashflow forecast. Computerised software packages can be purchasedto help you generate a report (we use Xero –http://www.xero.com.au). Or, you could tailor make your own. Here’s a simple method to do it yourself. Using a spreadsheet, create a table with appropriate headings. Choose the length of time over which you want to run your report and the periods within that time. For instance, you may want the report to show monthly amounts covering the next one or two years. In the first column, insert a heading entitled ‘Income’ and beneath that heading detail each ‘source’ of income. Add a row at the bottom for the subtotal. Then insert a heading ‘Expenses’ and itemise each expense under that heading. Set up a ‘subtotal’ at the bottom of this group. Next enter a row which shows the total of the income rows minus the total of the expenses rows for the month. Finally, insert a row for your running total. In this row, add your profit or loss for the period to the previous running total and this will show your financial position at the end of the period. Using your accounting records, enter your actual income and expenses in the applicable columns. Also, estimate and include any projected expenses in the coming months. Be realistic – don’t overestimate income or underestimate expenses. 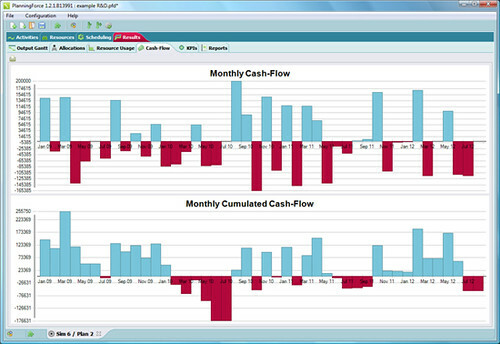 Cashflow forecasting can also be used as a budget planner. For example, you may know your rent will be increased at the end of the year, or that you’ll have numerous bills to pay next month. So you can make sure you keep enough funds in your bank account to cover these expenses. Your report will also indicate if you can afford to make an investment in your business; whether that means buying some new equipment, paying for staff training or an advertising campaign. Once you have completed your cashflow forecast, it’s important to keep it up to date. That means revisiting it regularly, say once a month, so that you’re always aware of how cash is flowing through your business. Ideally, you want to be in the position where you can control your finances, and step in and take action if necessary, so that you have enough cash to take care of all your expenses. An annual cashflowforecast willgive you all the information you need to keep on top of your business financially. You’ll have a clear vision of where and when you may need to cut back on spending. At the same time, it will highlight some potential areas where you can invest that little bit extra. Not only that, once your cashflow is on track, you won’t need to lose sleep worrying about meeting your expenses and the everyday running of your business. You’ll have more time to do what you do best and enjoy your business!